EL from "CALCUTTA*8 DEC.67" to "CORFU", fr. 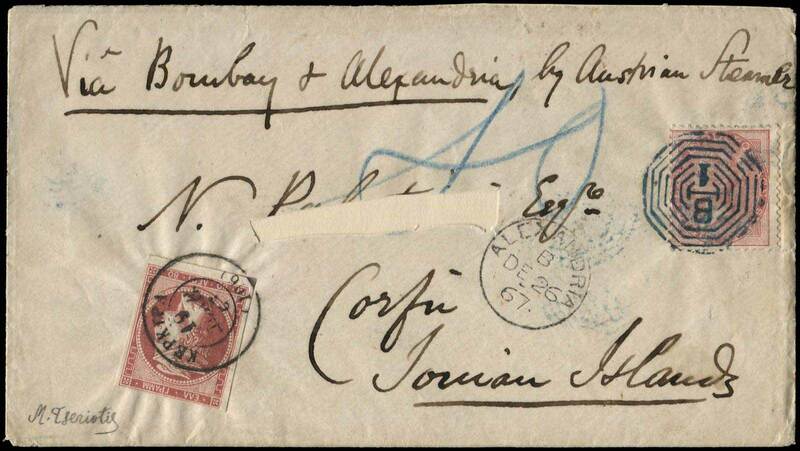 with 8a QV stamp and tied with blue "B/1" pmk, via "BOMBAY" and "ALEXANDRIA" by the Austrian Lloyd. The Alexandria-Ionian Islands rate of 80l. was paid with 80l. carmine. On the back red "CALCUTTA/INDIA PAID-DE 8 67" and black Greek P.O. "ΑΛΕΞΑΝΔΕΙΑ (ΤΟΥΡΚΙΑ)*5 ΔΕΚΕ.67" (Julian calendar). OΝΕ OF THE ΤWO KNOWN. Cetificate by Orestis Vlastos (1989). (Hellas 22a).